Track arm chair features a breathable slipcover over its hardwood frame with 8-way hand-tied coils and feather down cushion. 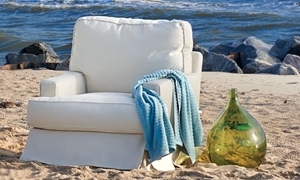 Inspired by the moments we take to relax and enjoy the breeze, the Two Lanes collection offers sofas, sectionals, chairs and ottomans to transform your home into a worry-free coastal retreat. Removable, cleanable slipcovers in breezy fabrics and charming neutral colors help embody the easygoing, casual vibe. Beneath, kiln-dried hardwood frames and 8-way hand-tied springs evidence the quality craftsmanship of the collection, providing durability and lasting support. Soft feather down is wrapped around the seat cushions for a comfortable and luxurious finishing touch. Additional slipcovers make it effortless to change the look of each piece with the turning of the seasons, or whenever you feel the need to refresh your décor.